The 'First Five Days Indicator' just came in positive, TheStreet has learned. This is the market data you need to know about, like now. 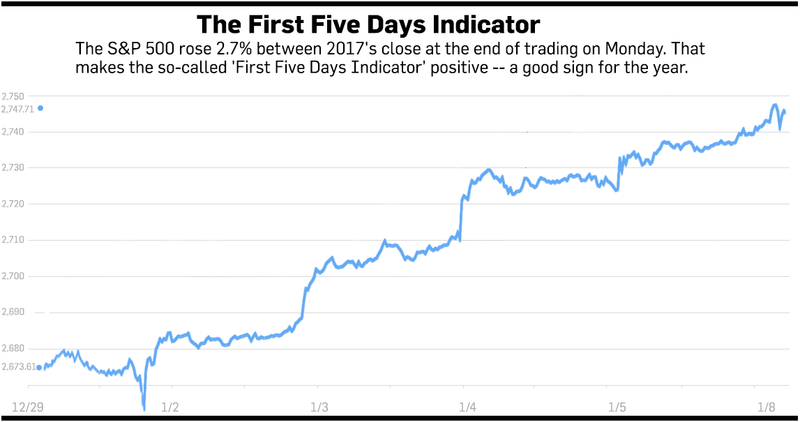 The "S&P 500 First Five Days Indicator" has come in positive for 2018, and Jeff Hirsch of the Stock Trader's Almanac says that means there's now an 83.7% chance that equities will rise for the year as a whole. That's good news for Wall Street, because stocks historically do poorly in a year that has midterm U.S. congressional elections. "While I'd love for the midterm year to have a textbook bear market [that offers buying opportunities], it's looking less and less likely," said Hirsch, who's editor of the Stock Trader's Almanac and chief market strategist at Probabilities Fund Management LLC. Hirsch's now-retired father Yale invented the First Five Days Indicator in 1972, backtesting it to 1950. The indicator holds that if the S&P 500 rises during the first five sessions of any given year, odds are that it will finish higher for that year as a whole. With the S&P 500 up 2.77% for the year as of the close on Monday (January's fifth session), the indicator has come in positive for 2018. In an interview shortly before Monday's close, the younger Hirsch said that the First Five Days Indicator has correctly predicted the S&P 500's annual direction in all but seven years since 1950. The indicator came in positive 43 times between 1950 and 2017 and the blue chips ultimately rose in 36 of those instances. That's an 83.7% accuracy rating. The Santa Claus Rally Indicator. Another market measure invented by Hirsch's dad, The Santa Claus Rally Indicator holds that stocks usually rise during the seven sessions covering the last five days of an old year and the first two of the new one. It's a good sign when that happens -- and this year, it did. The January Barometer. This measure looks at how the S&P 500 performs during January as a whole. If the blue chips rise that month, that's a positive indicator for where stocks will go over the entire year. We won't get a reading on that last indicator until Jan. 31, but in years when all three come in positive, the S&P 500 has risen 93.1% of the time for the year as a whole going back to 1950. That's partly why Hirsch's current "best-case scenario" has the S&P 500 ending 2018 at 3,300, up 23.4% for the year. Similarly, his best case for the Dow industrials calls for them to finish the year at 29,000, a 17.3% annual gain. The expert said Monday that if the January Barometer comes in positive at month's end, "that will be confirmation that our [best-case scenario] was bullish enough. And it might even push us into the 'Fully Bullish' camp."